Boeing's 747-8 Freighter, the biggest plane the company has ever built, on Tuesday successfully completed its first flight. The maiden flight carried more than 5,000 Boeing employees, customers and suppliers and was the first of over 1,600 hours of the test programme for this member of the freighter family, the company said. The aeroplane reached a cruising altitude of 17,000 feet (5,181 m) and a speed of up to 230 knots or about 426 km per hour. "The 747-8 Freighter is the new, high-capacity 747 that will give cargo operators the lowest operating costs and best economics of any freighter," it said. The airplane has a length of 250 feet and 2 inches (76.3 m)-- 18 feet and 4 inches (5.6 m) longer than the 747-400 Freighter. It will provide 16 per cent more revenue from cargo volume compared with its predecessor. Boeing had launched the air plane in November 2005. It is also developing a passenger version of the plane, which has already received 32 orders out of the total 108. The rest 76 are for the freighter. 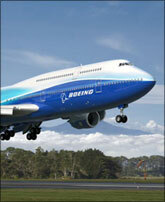 The company said the jets will be much quieter, more fuel efficient and have lower emissions than the 747-400 models. The first delivery of the freighter was scheduled for late 2009 and that of the passenger version for late 2010, but Boeing changed the dates due to design changes, limited engineering resources and an eight-week strike that shut down factories. Boeing Dreamliner set to take off. Finally!